The Prevention Services Division Communications Team launched a strategic partnership with another state agency that saves Colorado taxpayers $71,000 per year, provides better customer service to PSD partners and promises to make state government document delivery more efficient, effective and elegant. The collaboration between PSD Communications and Integrated Document Solutions (IDS) began when the Division’s fulfillment center contract expired in early 2012. The fulfillment center is used by partners to order free materials such as flyers, posters and documents PSD develops to promote healthy behaviors. PSD Communications wanted to take a broader look at document delivery and IDS was exploring ways to expand services at its new fulfillment center. The two state agencies worked together through a Lean event in Spring 2012 to identify Division-wide document ordering, printing and distribution needs and develop a low-cost, integrated process. Brandon Williams and Allison Hastey met with IDS team members throughout the summer and visited IDS’ Pueblo facility to plan the implementation. PSD is the first state agency to take advantage of IDS’ new web system capabilities, which currently include on-demand printing, PDF downloads and synchronization with the CDPHE print shop. In the near future, IDS will be able to produce templates that can be customized by partners to include local contact information, logos and services. IDS also will be able to create pricing packages for PSD programs. A half dozen PSD programs currently use the fulfillment center, but the service is available to all PSD. The fulfillment center is still in the Beta stage, but PSD and IDS are working hard to streamline the process. They envision a one-stop shop that is free and easy for partners to access and becomes a model for other state agencies. 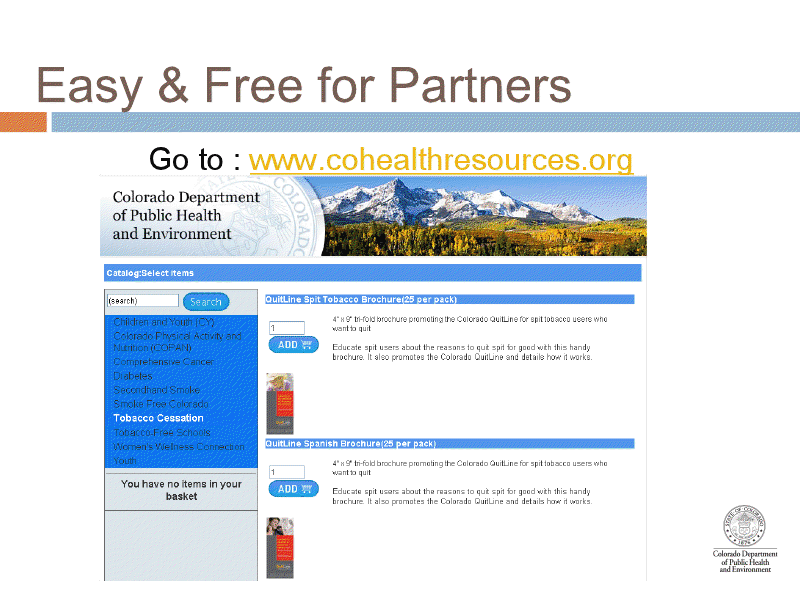 Go to www.cohealthresources.org to order materials. Contact Brandon Williams or Allison Hastey to add your program's materials to the fulfillment center.